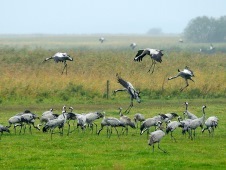 Common Crane Grus grus suffered a substantial population decline and range contraction in Europe prior to the 19th Century, with drainage and development causing wetland habitat loss, and unsustainable hunting also taking its toll. However, through improved protection of remaining habitat at key breeding, passage and wintering sites, including designation of Special Protection Areas under the EU Birds Directive, the species has since made a remarkable recovery. A steady population increase has been recorded in Europe since the 1960s, and the species has recolonised a number of European countries, including the Czech Republic, France, the Netherlands, the UK, Denmark and parts of Germany. Estimated population size of Common Crane in Western Europe. SOURCE Deinet et al. (2013) Wildlife comeback in Europe: The recovery of selected mammal and bird species. London, UK: ZSL.